Earlier this year, I purchased a Nitecore NU30. After using sporadically for a few weeks, I noticed that the hinge no longer held the light firmly at the angle I wanted. The way the indexed hinge mechanism works is, on the main body of the light near the hinge, there are two cylindrical gears which mesh with teeth attached to limbs on the strap side of the light. These plastic limbs are supposed to apply pressure, forcing the teeth at the end of the limbs into the teeth of the gears on the main body. Upon close inspection, I discovered that the limbs on the strap side of the light were fatigued, causing them to crack, which then prevented them from properly holding the light at the desired angle. The middle piece is my original part. The piece on the right is the replacement Nitecore sent to me. In both pieces, the limbs have fatigued during use, causing the limbs to break. The second pic is a closeup of my original piece. If you look closely, you can see where the limbs are starting to crack. This is what caused my original warranty claim to Nitecore. I suspected this was a design flaw or poor choice of materials and when I asked them if this was a common problem, they said it wasn’t and that my problems were caused by improper usage on my part. They were nice enough to ship 2 back pieces, charging me $5 for shipping and since replacing the original piece, I’ve been extremely careful when using the light and have used it sparingly (3 or 4 times at best). This is why I was so surprised to see the same issue occurring with the replacement piece. My question is: Has anyone else experienced this issue with their NU30? I also own an NU20, which uses a different hinge system and have had zero problems with that light. Yep, the plastic from mine is also starting to crack. It still keeps it angle but I see a little wear on the teeth. Haven’t used it all that much, kept it in my backback as a spare. Don’t hve much time now but I’ll inspect it a little closer tonight and maybe take some pics. I’m now worried that mine would suffer the same fate. So far it’s still OK. I just keep it in my sling bag as an emergency light. Nitecore products aren’t cheap and therefore we expect better quality than this. I own a lot of Nitecore products and for the most part, have been very pleased with what they offer. This one, however, is a dud. Not the light and it’s electronics (which I really like) but the hinge system and the fact that they tried to pass it off as my fault. I suspect that more and more people will discover this issue with the light. Hopefully Nitecore will wake up and come up with a fix. Thanks for letting us know. My NU30 is still intact and as good as new. Mine also broke today just by checking it. One of the hinges broke, also the plastic around is cracking. Idk if I wanne pay shipping for spare parts that most likely will break again. I’ll send them a mail with pictures anyway. Nitecore charged me $5 US shipping and sent out 2 strap-side pieces, one of which (as I stated in my OP) has already broken. The idea of having to continually purchase replacement pieces every month or so for $5 is ludicrous. Clearly a flawed design. My NU20 (which I EDC and actually USE everyday) shows no signs of breaking. The hinge on it is more like the Fenix in tatasal’s pic. You’re very welcome. I really think this is a poor design and that Nitecore is going to experience a lot of issues with it. The question is, what will they do? I’m hoping for a redesign of the strap-side piece to address the breakage. Please don’t let me down, Nitecore. I also stocked two with broken holders, not used, only. 2 months old. Have tried with glue, but does not hold. I also stocked two with broken holders, not used, only. 2 months old. Have tried with glue, but does not hold. Wow! That’s horrible! At this point, I’m not even using the light for fear of breaking the last piece I have. I hope they step up to the plate and work out a fix! I’m going to try to use some JB Weld or 5 minute epoxy to support the piece, but that will leave an unsightly bump. No problems with mine so far. I have the green one. Wonder if the plastic is somehow tempered different. So far, the only ones I’ve seen cracked or broken are the black models. What about NU10 and NU20? I don’t have an NU10 so can’t say. As for my NU20, the hinge mechanism is different and does not appear to be prone to the fatigue which seems to plague the NU30. You’re welcome. I love my NU20 as well. Bought the NU30 because of it’s longer run time, more versatility and higher output AND the side mounted USB charge port, which would allow running it while charging. The bottom mounted charge port on the NU20 doesn’t allow you to practically wear and charge the unit. The NU20 hinge seems much more robust and it’s light weight makes it easy to EDC. Been using it every day with no issues, so far. Both NU30 and NU10 still new. hopefully its won’t happen to me. I’m more on NU10 due to arm level work. Anyone else having issues with the hinge of their NU30? Same exact issue for me! Used only a dozen times at most. The hinge kept getting looser until one night it went completely floppy. Then when I got home, dropped it from waist height and the hinge shattered and headlamp came off. What a piece of sheeet! Of course this wouldn’t happen with the NU20 as this is lighter/ smaller which would create much less wear or force on the hinge. Unless they have changed the design, I suspect this will happen with all NU30 (unless other color plastic made better). Total junk and wrong that you have to pay ANY shipping cost for replacement parts. Nitecore charged me $5 (shipping only) for 2 back pieces. Yes, it was nice of them to charge me only shipping, however since I suspect this is either a design flaw or materials issue, that really puts it on them. Furthermore, after receiving my replacement pieces, the first replacement broke within a few weeks of use. It’s not like I’m trapezing around in the woods every night for 8 hrs at a time with the unit strapped to my head. I periodically check the property for 15-20 minutes 3-4 times a week. I’m afraid to use my final back piece for fear of it breaking. Not exactly a reliable piece of kit that I can have confidence in when the chips are down. Almost immediately after receiving my replacement hinges, the first one broke. Afraid to use the second one, my NU30 has sat idle for nearly the past year. Sad. I get that this is my fault for not following up, so I’ve reached out to Nitecore again, to see if they have done anything to resolve the issue. I’m hoping they have started using different materials, but I’m not holding my breath. Taking RobertB’s advice (liked your old avatar better, FWIW), I’ve asked that in lieu of a materials/design change, if they could possibly provide me with hinges of a different color, as RobertB has reported no issues with his green unit. In the interim, it pains me to see the NU30 just sitting on my desk, unusable so I’ve come up with a possible fix. Parts needed are a tube of superglue, a pair of scissors and an old credit card. It turns out that if you cut a strip from your typical credit card, then cut it in half, it’s just about the perfect length for the fix I have in mind. It’s not terribly technical so I’m just posting a pic of the “fix”. Note: This is just a short term fix. It appears that the black hinges are made of particularly brittle plastic and if that is the case, it is just a matter of time before the rest of the hinge unit begins to crack as well. Come on, Nitecore, please step up to the plate! Some basic advice: If your piece is already broken, I’d glue the tab back on first, then do the credit card thing later. Also, when doing the credit card, I found it useful to put some curvature into the card before gluing it. 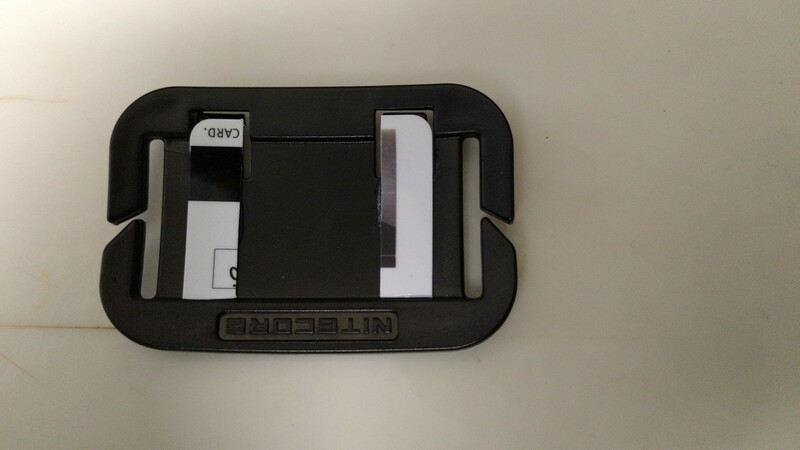 It allows the credit card to better fit the shape of the bracket. After fixing my tab, I laid down a thin line of super glue on the bracket, then attached the credit card strip. I’m letting the glue dry completely so haven’t tested it yet. I’ll post as to the success/failure once I’ve used the light. On a personal note, I’ll never purchase another NU30 again. Also, while I’m a big fan of Nitecore products, their lack of action regarding this issue concerns me greatly and makes me think I might need to start looking at other manufacturers, people who have better design ideas, listen to their customers and stand behind their product. As an example, take the NU25. Looks to me like they stuck with the hinge design of the NU20, which makes sense, but is almost a tacit admittance that the hinge of the NU30 is flawed. That being the case, why did they not follow the request of many users and place the USB charge port to the side, where it could be used WHILE wearing the headlamp? It seems quite half-assed to me that they didn’t address this issue. Oh well. Stepping off my soap box now. Well the fix was marginal at best, then as I added the strap back on, the hinge area cracked, similar to the issue muellihenry had. No word back from Nitecore regarding shipping me green hinges. I’m very disappointed at this point. Was planning to purchase another NU20 and/or an NU25 to replace the NU20 that I recently lost, however if this is the level of customer service that Nitecore is offering, I’m afraid I’ll have to find another company to purchase lights from. Even though I had no issues with my NU20, on principle, I can not continue to purchase lights from a company that won’t support their users. Does anyone have any recommendations for USB charged headlamps similar to the NU series? Thanks so much for your contact. I’m really sorry to know that the bracket broke again. Yes, we have updated all the brackets for NU series. Which color do you prefer? We’ll send it to you. dekozn, muellihenry and treoneo have all reported having the same issue. I recommend you contact Nitecore. Thank you Nitecore for renewing my faith in your company. 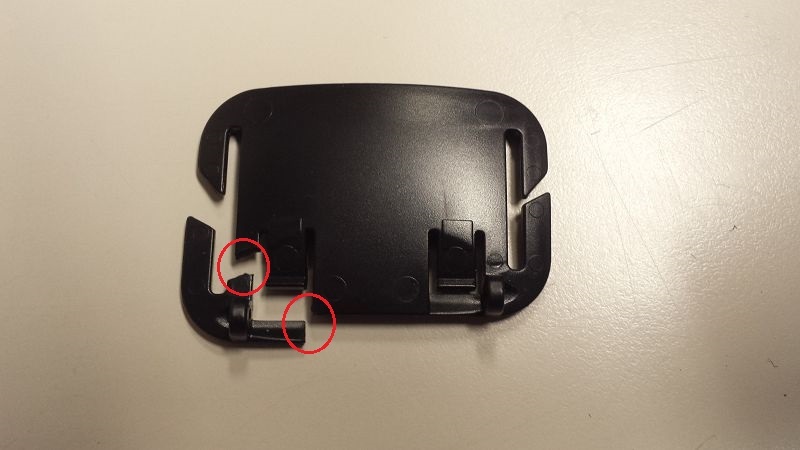 In my recent email convos with them, they had agreed to send me replacement strap-side brackets made with new materials to replace what I was calling a “materials” issue. Regarding the replacements, they asked me what color I wanted. I informed them that my light was black, however, taking RobertB’s advice, I asked if if would be possible to get the OD green bracket. About a week ago, I received a package in the mail from Nitecore. To my surprise, there was a pair of black brackets along with a pair of green brackets. It’s visibly obvious that these are made with a different type of plastic. The original set of black brackets that I had (and the first set of replacements) was a lot shinier. The ones I just received have more of a matte finish to them. I initially installed a new black one on my Nitecore strap and used it for a few days without issue. I’ve since installed a green bracket on the back of my ball cap. It took quite a bit of effort and required significant force to get the bracket into the rear strap, but I managed to do it without breaking the bracket and for the past 5 days, I’ve been using the NU30 daily, ratcheting the light up and down with no issues. Looks like Nitecore has updated their product with the proper materials. Thanks Nitecore. You’ve restored my faith in your product and service. I have the same issue with mine. Is there a certain person at Nitecore that you contacted or just general support? On my NU10, the plastic holder cracked 5 minutes after unpacking. I fixed it by sticking the plastic plates to cracked places. Even the eyelets holding the headlamp snapped. I stuck my eyelids, screwed the head and used screws. I’ve been using it for about a year. I recently bought another NU10 headlamp and another bracket. I have the same issue with my NU30 (purchased it here from a groupbuy last year)…just used it for the 2nd time, sortly for a week…real bad quality plastic bracket, it just broke without any pressure. 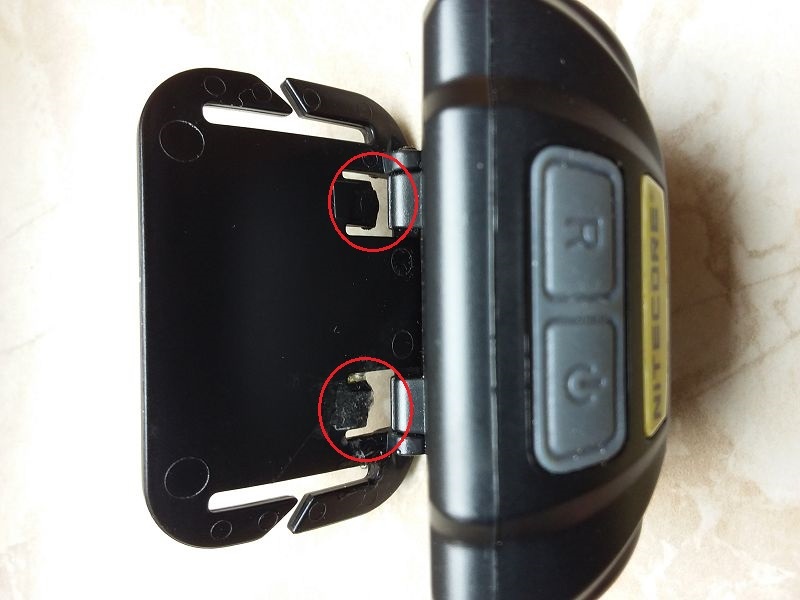 I love my ‘old’ Petzl Tikka but it has only about 100lm, that’s a big difference, but anyway I have send a mail to service@nitecore…so after the Chinees holiday I like to find out if a replacement is still available. _We can mail you two brackets for NU30 from China, but it will cost 8 USD for international shipping, payment can be made to our PayPal account sales@nitecore.cn. After payment is made, please notify us (send us the screenshot of payment) and provide your shipping address, full name of recipient and contact number. I was afraid that would happen, it was the reason I didn’t pull the trigger on this one. Similar thing happend to me with an early Fenix Hl20 headlamp. The silicone based headstraps are the way to go….